Linzer cookies are a classic favorite around the holidays. Give them some extra pizzaz with festive holiday shapes. Fill them with one of our delicious jams and everyone will be begging for more! 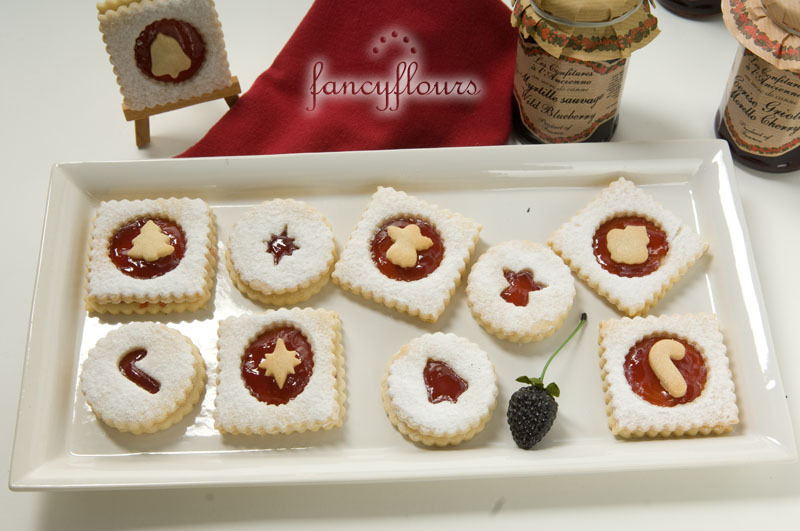 Christmas Linzer Cookie Cutter Set and assorted jams are available now at fancyflours.com. This entry was posted in Baking Inspiration, Christmas Baking Ideas by Fancy Flours. Bookmark the permalink. How about a recipe for these lovely cookies? Maybe including which of your products to use where??? That might inspire me to get the whole lot! Thanks! I have recently fallen in love with your products! These are so great…and I am a huge fan of your new postcard cookies. They are easy and fun! Yes! A recipe for these festive cookies would be extra nice. What size square cutters are you using and are you using the recipe you have listed on your site. These are so cute, I really like how you changed them up with square and round cutters.